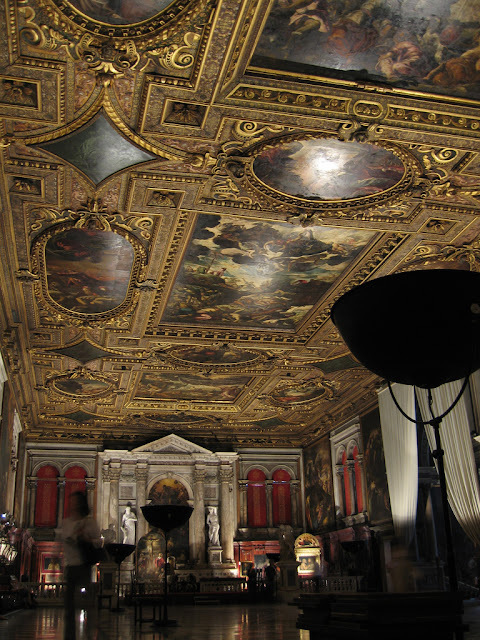 Scuola Grande di San Rocco in Venice, Italy, is home to Tintoretto's Ceiling. Photography in this post is via Wikimedia.org and is public domain. 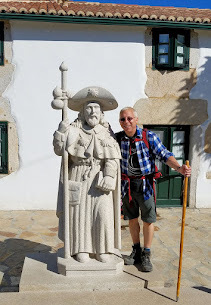 Welcome to ArtOdysseys—my monthly feature that unites my love of art and travel. My focus is on “Ceilings” so I chose “Tintoretto’s Sistine Ceiling.” Intriguing title, huh? Tintoretto's Ceiling decorates the ceiling of the Sala Superiore on the upper floor of the Scuola Grande di San Rocco in Venice, Italy. Ever since studying the masters of the Renaissance and Mannerism periods, I have wanted to see the Tintoretto’s Ceiling of the upper salon at the Scuola Grande di San Rocco in Venice, Italy. Often compared to Michelangelo’s Sistine Chapel, I had to see for myself how such comparisons could be made to one of the most highly respected and admired artists of all time. Fueled by my passion for art, I set out on a mission while in Venice to see this Grand Sala and to satiate my curiosity surrounding “Tintoretto’s Sistine Ceiling,” an extraordinary collage of 21 canvassed paintings affixed to the ceiling of the Sala Superiore. But before we dive deeper into the ceiling, I have to share an anecdote I read in Peter Ackroyd’s “Venice: Pure City” about Vasari’s account of how Tintoretto won the commission to decorate the ceiling and walls of the Scuola Grande di San Rocco. According to Ackroyd and Vasari, the artists of the time were asked to present sketches for the central panel of the Sala dell’Albergo ceiling, a smaller chamber off the Grand Hall on the upper level of the school. 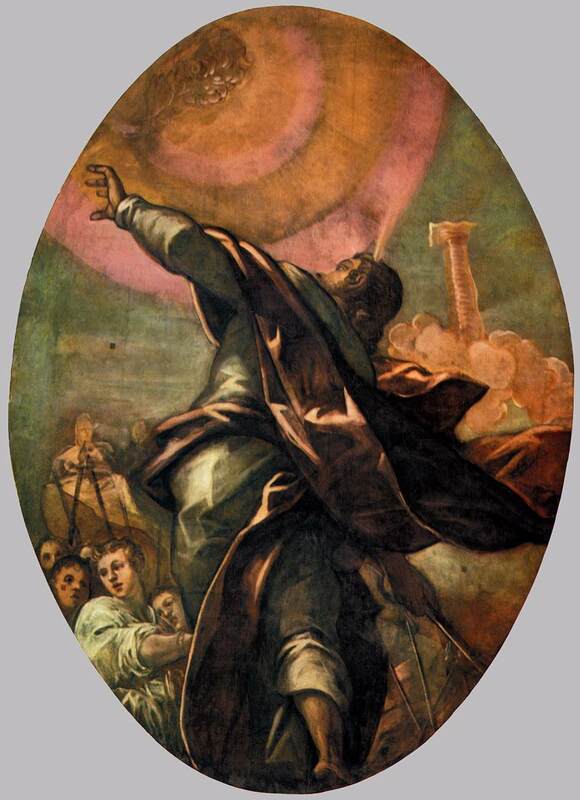 Instead of presenting a sketch as requested, Tintoretto in a brilliant “stroke” of genius that ultimately earned him the commission, merely pointed up to the ceiling to showcase his entry. Affixed to the ceiling was not a sketch but a completed painting for the Guild to scrutinize, and what makes this really special is that he offered it as his gift to the school whether or not he won the commission. His “Glory of San Rocco” still hangs there today. 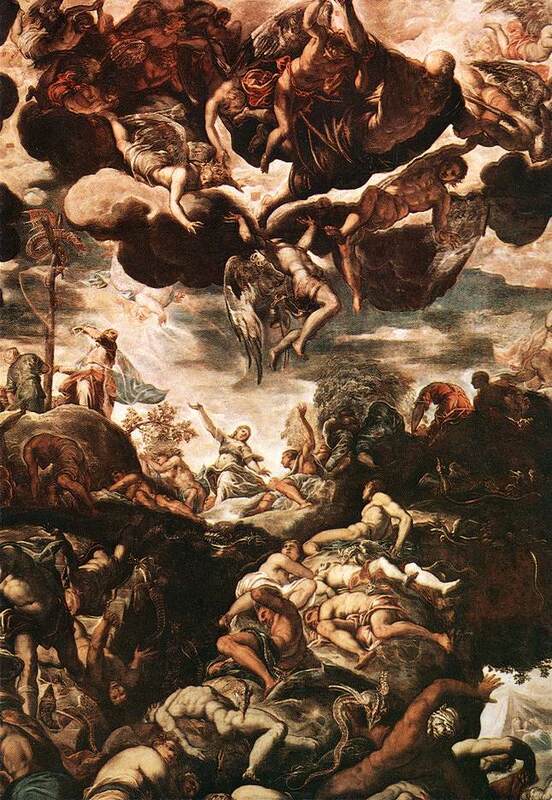 Tintoretto's "Glory of San Rocco" earned Tintoretto the commission to decorate the Scuola Grande di San Rocco halls. Having won the commission as the result of his ingenious presentation, Tintoretto and his assistants completed the paintings on ceilings and walls between 1564 and 1587. The Sala Superiore is a tapestry of 21 panels depicting scenes from the Old Testament and set within highly ornate wood and gilded framework creating extraordinary masterpieces of each of these canvas paintings. The panels are organized around the three central canvases depicting the plagues suffered by man: thirst, hunger and disease. “Moses Drawing Water from the Rock" represents water, “The Brazen Serpent” represents disease and “The Miracle of Manna” represents bread and hunger. It’s no coincidence that these themes are accentuated inside a school that takes its name from their patron Saint Roch or San Rocco, protector against the plague. “The Brazen Serpent” was the first of the ceiling’s paintings and was completed in 1576. While en route to the Red Sea, the Israelites are plagued by serpents sent by God for their complaints against Him and Moses. Moses is shown here, upper left, holding a cross with a bronze serpent that healed all those seeking redemption in the Lord. This particular painting also served as a poignant reminder of the 1576 plague that wiped out a quarter of Venice’s population in just two years. “The Brazen Serpent” was the first of the ceiling’s paintings and was completed in 1576. In “Moses Drawing Water from the Rock,” God is shown floating on His diaphanous globe and assisting Moses in his quest to quench the thirst of the parched Israelites. If you look in the middle-right background, you will see the Israelite camps under attack by the Amalekites. 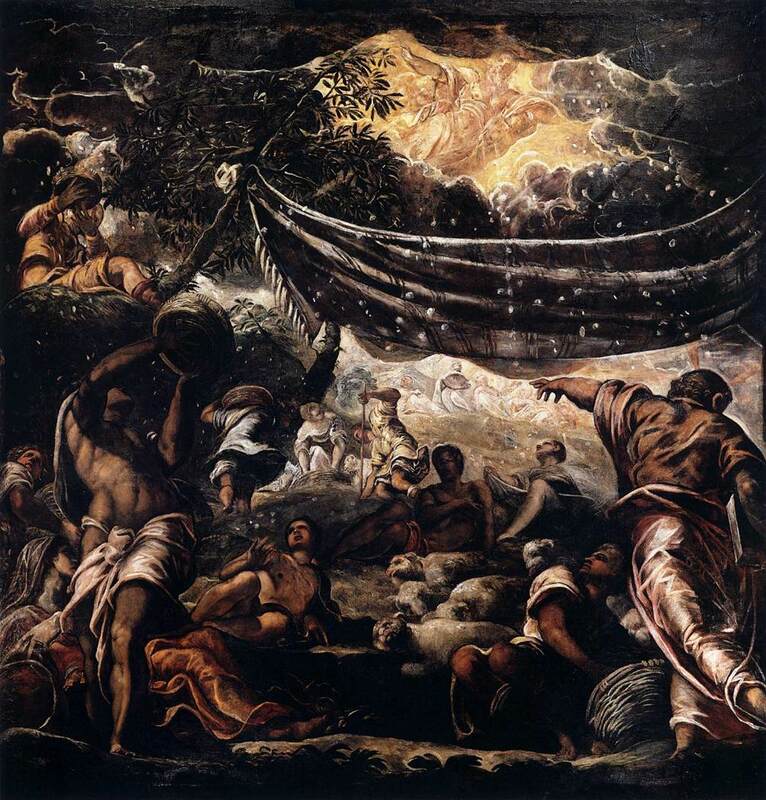 Tintoretto's "Moses Drawing Water from the Rock"
“The Miracle of Manna” depicts the miracle of raining manna or Eucharistic wafers from the darkened sky from God to the Israelites after their exodus from Egypt. In the "Miracle of Manna," wafers or Eucharists rain down from darkened skies to bring food to the Israelites. “The Pillar of Fire” sent by God materialized in the desert to thwart advances by the Egyptians as the Israelite’s fled into the parted Red Sea. Tintoretto's "Pillar of Fire" was sent by God to impede advances by the Egyptians as they fled into the Red Sea. Take a virtual tour through the Sala Superiore at the Scuola Grande di San Rocco. 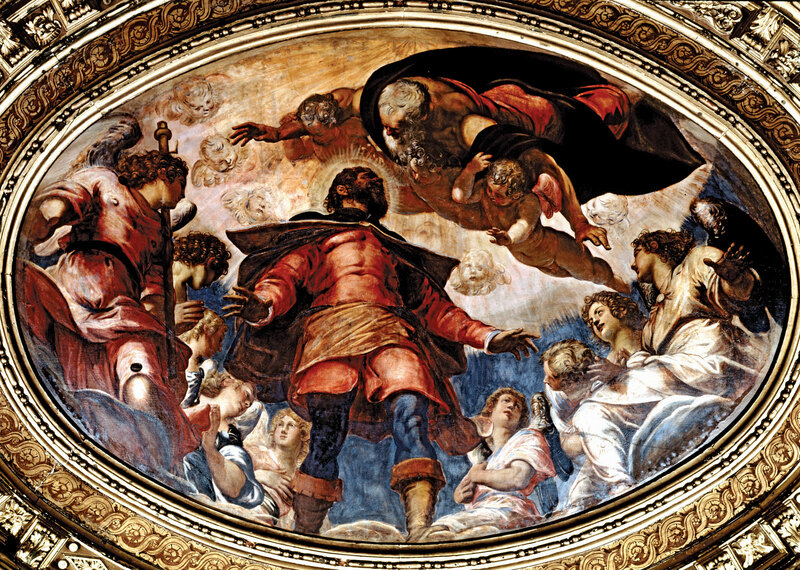 You will need a Quicktime plugin to view this extraordinary look at the Sala and Tintoretto’s ceiling and wall paintings. In addition to the ceiling, Tintoretto completed the walls of the Sala Superiore but with the stories of Christ and the New Testament, the ceiling and walls of the Sala dell’Albergo, and the Sala Terra on the ground floor with his “Annunciation” among others from the New Testament. Dedicated to San Rocco or Saint Roch, the protector against the plague, the Scuola Grande di San Rocco was designed and built by a confraternity or guild of some of the wealthiest Venetian citizens in the 16th century. It's located in the San Polo sestiere in Venice, next door to the Chiesa San Rocco—another edifice that Tintoretto decorated as well and from which the Scuola derives its name. As I alluded at the beginning of this article, the Sala Superiore does bear a striking resemblance to the Sistine Chapel for a few reasons specifically as it relates to subject matter of the ceilings being that of Old Testament while the walls, or half of the walls in the case of the Sistine, being that of the New Testament. In addition, both represent extraordinary work by each of the artists. However, I think that's where the comparison ends. Each deserves its own time in the spotlight so to speak. But I must say this...had it not been for such a comparison, my curiosity may not have been piqued and my discovery of Tintoretto's ceiling may not have ever happened. All in all, the next time you visit Venice, make sure you save a few hours to admire the magnificent art throughout the Scuola Grande di San Rocco and let me know what you think. Wow! 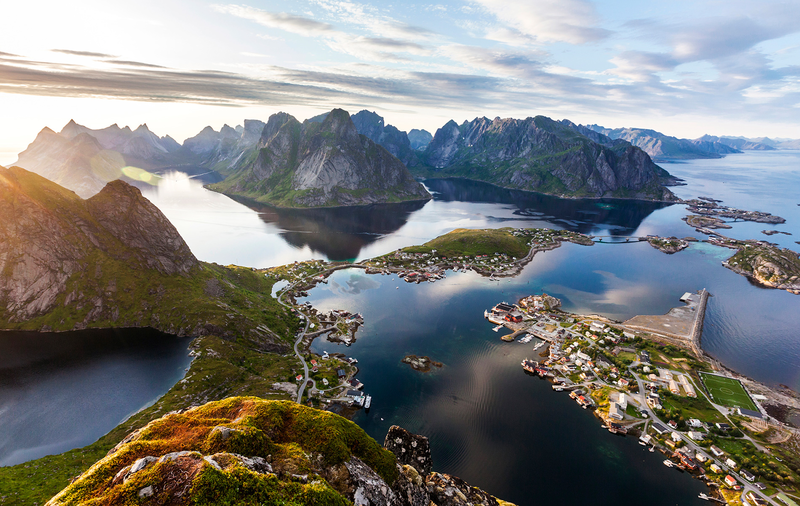 What amazing shots! Makes one feel actually being there. No, even better because those paintings look so much nearer. Hi Marlys and I couldn't agree with you more. This ceiling blew me away. Actually, I attended a concert here the last time I was in Venice and I tell you the experience of sitting below these extraordinary paintings while the sounds of the symphony echoed the halls was exhilarating! Thx for stopping by and sharing your kind words! Well then, you really need to get back and experience it all over again! Me too, after writing this article, I want to return as soon as possible! Thank you for stopping by to share your experiences. Thanks so much for your comments. We publish these monthly by the way although I have missed the last 2 months of posts. Have you checked out the other Roundtable posts as well? Thx again! I absolutely LOVE Italy. Having spent my summer in Rome, it changed my life forever. Tintoretto's ceiling is definitely incredible, and there is a panel that resembles the Last Judgement painting by Michaelangelo. For me, you can never go wrong visiting Venice and Rome...two stunning treasures. Great series and thank you for this wonderful post! I couldn't agree with you more!! I love Tintoretto's work and actually, I had the pleasure of listening to the symphony performance beneath this glorious ceiling--truly and unforgettable evening! Thx so much for stopping by and sharing your thoughts! Great article and superb photos! Hi there my friend and thank you so much for your kind words. 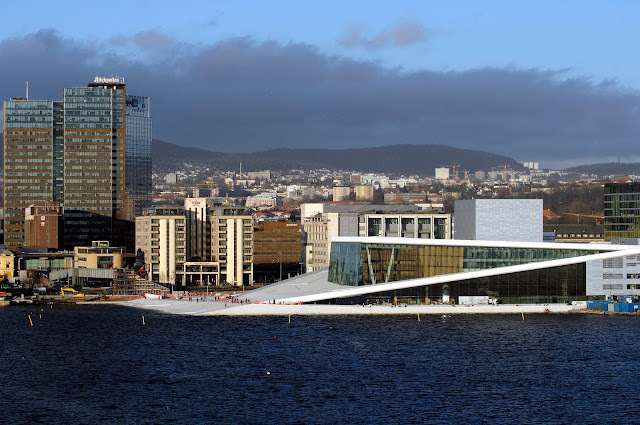 You have a very interesting site and can't wait to take a deeper look into your fascinating tours! Hi there Marla!! Thank you so much for your kind words! I am glad you enjoyed the article! When I was in Venice last fall I stayed right around the corner from this school. pity I did not manage to see this! Hi Penny and thank you so much for stopping by! So close and yet so far my friend. No worries though, now you have one more reason to get back to Venice! Love Tintoretto, love Venice. Incomparable post, Jeff! You are so kind Lesley! 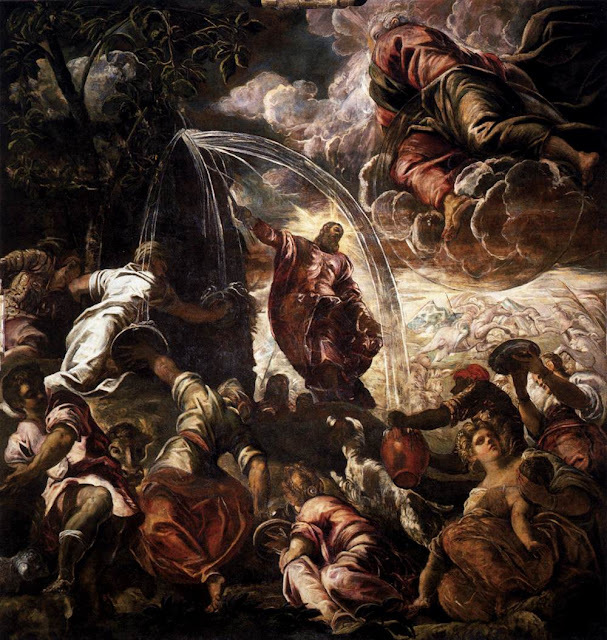 I too fell in love with Tintoretto after seeing this magnificent work of art !! And the story behind it, even more fascinating. Thank you so much for stopping by and for your kind compliments!